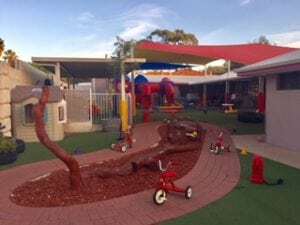 There is growing momentum in Australia and around the world to broaden our understanding of the traditional ‘playground’ concept. For this reason we have used the term ‘play space’, as it incorporates a greater range of play experiences that might be suitable for our children. For instance, gardens, art, music pieces, places to socially interact and outdoor classrooms may be included within our play space. A broader notion of ‘play spaces’ also recognises the valuable way in which play contributes to child development and learning outcomes. Supporting a broader range of play experiences also complements and extends the classroom learning environment. We are aiming to create play spaces that provide contact with nature, stimulate creativity and imagination, and encourage ‘active play.’ As much as play spaces need to be safethey also need to be challenging to scaffold further learning supporting exploration and experimentation. 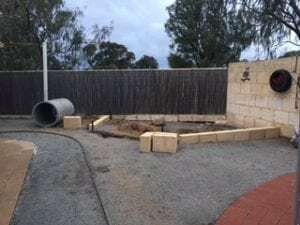 Play spaces need to offer challenges as well as adhering to safety standards. 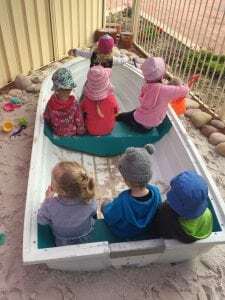 The Early Years Learning Framework for children from birth to five years of age emphasises the need for a ‘play based learning context’, with a focus on the natural environment (Outcomes 2, 3 and 4), so that children may learn about the social world. 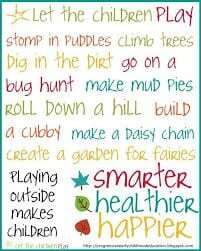 As well as the value of playitself, play spaces provide important learning opportunities. A compelling body of evidencehas shown that through play in nature, children improve cognitively, emotionally, socially, physically and behaviourally. Furthermore, researchidentifies that play and learning are inseparable dimensions particularly in these precious early education years and that teachers achieve the best educational resultswhen we focus on supporting children’s play. 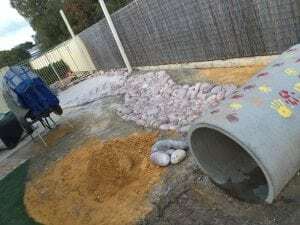 At Kids College we are constantly improving and our next project is the next stage of our outdoor play space development. We are aiming to create and maintain play spaces that support children’s development, learning, health and wellbeing while reducing the risk of serious injury. 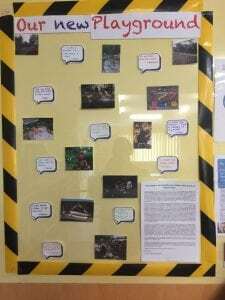 We started with children’s voices and found out what they wanted in their play area, our staff team wish list and we consulted families for their views. 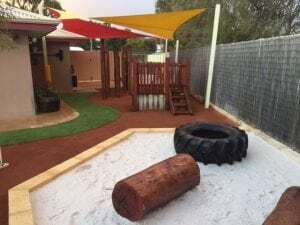 We offer a balance of active and quieter play areas for uninterrupted play and adjust to have an inclusive environment that is designed to invite open ended interactions, spontaneity, risk-taking, exploration, discovery and connection to nature. Not only was the action outside, we also created indoor construction zones to play at being Landscaper Brett. We already enjoy;a whole play structure with multiple slides, cubby areas and climbing steps; open area for free play run; loose parts to create balancing and obstacle courses; tunnel; cubby house; sports and fundamental movement equipment; natural wooden logs; sandpit; an army of bicycles and tricycles; outdoor art easel; water fountains; wooden blocks; soft play blocks; wood chips and our veggie and herb patch. 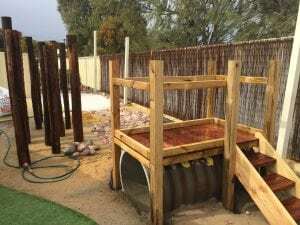 In our current phase of our play space design we have added a wooden cubby above the tunnel, a stone stream with a water pump, a beach scene with a boat in a large sandpit, another huge sandpit including wooden play, tree for shade, loose parts play area, a yarning circle to celebrate our Aboriginal and Torres Strait Islanders cultural heritage, a forest of wooden posts, native plants and different sensory surfaces and a mud kitchen area! Active and free play areas, as a rule of thumb is to have one third of the play space as free open space to give children freedom to run. 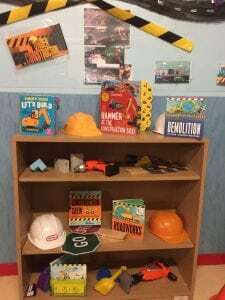 Quiet areas, to give children a safe space to build up confidence through creating semi enclosed spaces for discovery. 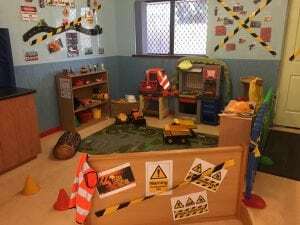 Social play areas, to encourage language and cooperation skills as children role-play and learn to take turns and share, we have used suggestive structures that invite and inspire imagination and creativity. 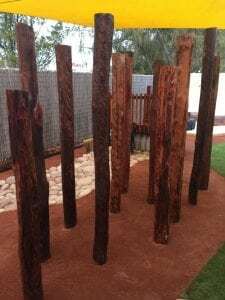 Imaginative, creative, exploratory and natural play areas including trees, shrubs and ground covers that provide different scents, textures, shapes, colours and sounds that help stimulate imaginative and creative play. 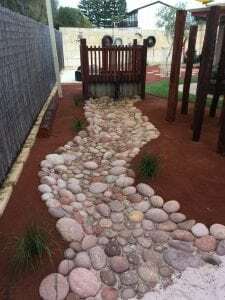 Natural play space is the elements of a playground consisting of natural, non-manufacturing items that are incorporated into the playground, including items such as logs, boulders, plant materials and surfaces, changes of levels and other landscape elements. Natural space encourages children to explore relationships with living things and enjoy the aesthetic qualities of nature. ‘Maybe if we provide more places planted for play- places that are easy to get to, familiar and engaging, and sense-filing the children will joyfully play there throughout their childhood and carry the memories, discoveries and possibilities into their futures. Quoted from “Museum notes – Planting for play” by Jeanne Vergeront. Physical development.During planting children use fine motor skills when crumbling clods of earth, holding the plants, patting down the earth and when gently holding the worms they find as well as learning about environment and sustainability. All materials were selected to tie in with a West Australian native theme & are environmentally & water conscious. 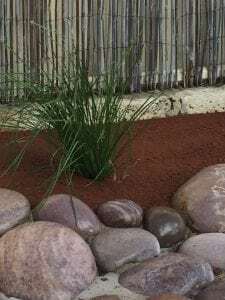 Kangaroo Paws Bush Blitz – (near water feature), Corymbia – Dwarf Ghost Gum (next to yarning circle) and Lomandra Tanika (native grass along creek bed). 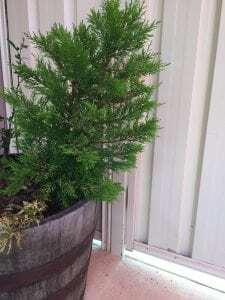 Pot plants are Syzgium Big Red & Cupressocyparis (Leightons green). Risk aversion needs to be balanced with the essential need for play to incorporate challenges and child development needs. There are various measures to address safety. 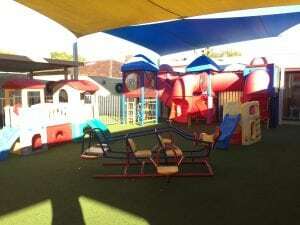 Aside from good play space design, high quality construction standards and regular maintenance, we will ensure that our children are adequately supervised to ensure their involvement and engagement in our play space is safe, educational and fun. 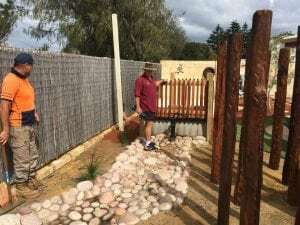 Australian standards for playgrounds recognize that children need opportunities to experience risk and challenge in playgrounds and the standards focus on the elimination of hazards likely to cause serious life threatening injuries. The standards do not advocate risk-free playgrounds. To assess the suitability of design we conducted a risk benefit assessment, a tool to aid risk management that explicitly brings together consideration of the benefits as well as the risks of play in a single judgment. What this means is we have taken into account any risk to the children against the benefits of the play ideas. 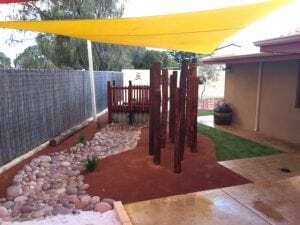 This ensures an age appropriate exciting play space that is perfect for children to explore and enjoy safely. 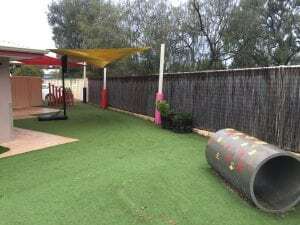 Examples include our choice of synthetic grass which ensures inclusion of all children regardless of age or ability with wheelchair access, textured aspects for children with sensory processing disorders, low maintenance, not displaced by children’s play, has no retaining edges, is porous, waterwise and is very environmentally friendly. We also chose to put softfall under our synthetic grass to offer even more protection from fall injuries. 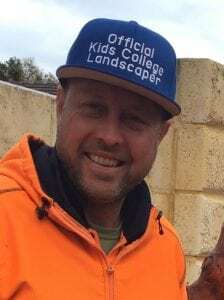 Proprietor of Form Landscapes, Brett Grono grew up at the foot of the Blue Mountains in NSW. Inspired by native bushland, flora and fauna at a young age, he always knew he would want to work in a field he was passionate about. 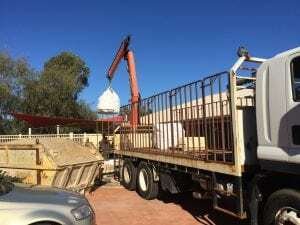 He completed a Horticulture and Landscaping Trade at Hawkesbury Agricultural College – graduating at a distinction level. 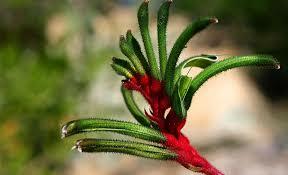 Then completed his apprenticeship with a prominent landscapes company in the heart of Sydney. 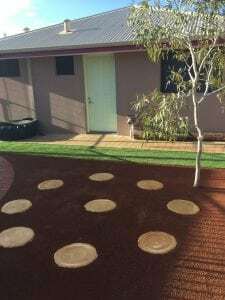 He has also completed future studies in Landscape Design, Costing and Estimating and Water Wise Garden plus gained a vast amount of local knowledge and contacts. 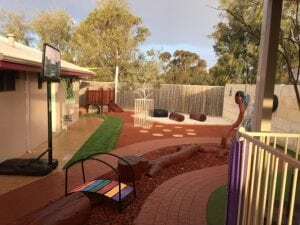 3.2.1 Outdoor and indoor spaces are organised and adapted to support every child’s participation and to engage every child in quality experiences in both built and natural environments. At Kids College we work each day embedding our values and philosophy into each facet of what we do. We continually improve our practices by critically reflecting and engaging in meaningful relationships with our community and for this we need your support and input.